At what point do you begin to erase an earlier label that was given to you as a player? Can you totally overcome a negative stigma associated with that label? At what point does a team peak with its full talent on display?? Just think that only a year and a half earlier, the Steelers were 3-1-1 at midseason, and mired in a quarterback controversy between “Jefferson St” Joe Gilliam and Terry Bradshaw. Pittsburgh won with defense and a running attack in spite of the quarterback. After alternating between the ineffective Gilliam and Bradshaw, Noll finally gave the nod to Bradshaw. Many speculated Pittsburgh wasn’t ready for a black quarterback. 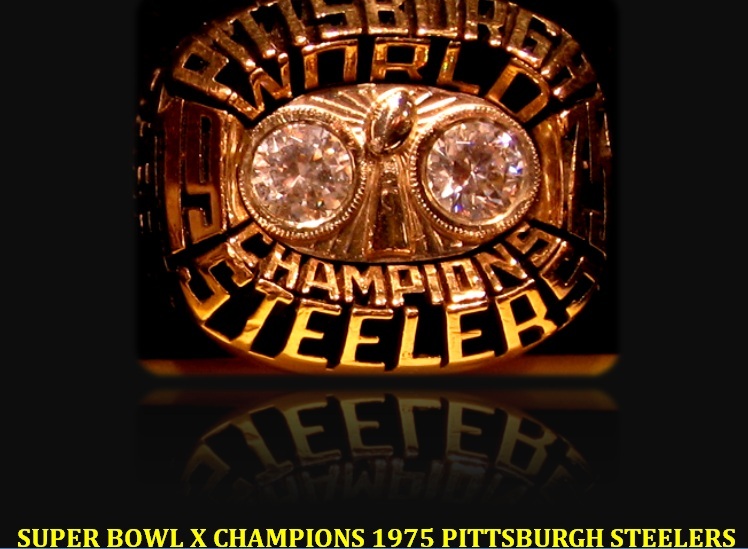 Did you know the 1974 Steelers were the only Super Bowl champion that completed less than 50% of their passes?? Gilliam went 4-1-1 in his starts completing 45.3% of his passes (96 of 212) for 1,242 yards 4TDs and 8 interceptions. Bradshaw finished completing 45.3% of his throws (67 of 148) for 785 yards 7 TDs with 8 interceptions. Terry, having gone 5-2, was sacked more and threw interceptions at a higher rate than Gilliam. So he really never beat him out. After an upset victory in Super Bowl IX established them as league champion, the confident Steelers rolled through the next year with Terry Bradshaw at the helm. The Steelers were led by their famous front four known as the “Steel Curtain”, their powerful running game, and Bradshaw received some credit for being the quarterback of the champs. Yet the respect afforded the Steelers QB was begrudging and not to the level of previous winners like Unitas, Staubach, Greise, Dawson, Starr, or even Fran Tarkenton who hadn’t won one yet appeared in Super Bowls twice. The 1975 season began with a first time champion who was one of the youngest teams in football. They were just developing as a team having come through the ’74 season with 8 rookies on the roster. They hadn’t hit their peak as a team. Even Bradshaw was just shaking off the bad play that had him labeled as “Lil Abner” and a “dumb” quarterback. He hadn’t lived up to his billing as the number 1 player in the 1970 draft until now, but with a pair of second year receivers in Swann and Stallworth, they were developing to complement the running game. The strength of this team was its defense and running game. Franco Harris again rushed for 1000 yards and the Steelers went 12-2 in the regular season. The Steelers were beginning to become bigger than life with Joe Greene, LC Greenwood, Ernie Holmes, Jack Lambert and company. 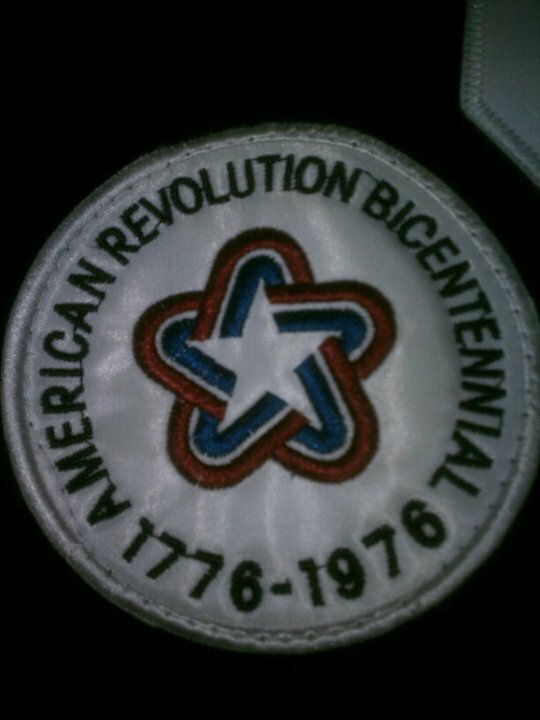 The patch worn by each team in Super Bowl X.
Bradshaw had improved as a quarterback in 1975 as he emerged as a leader. He completed 57.7% (165 of 286) for 2,055 yards 18 TDs to just 9 picks. Yet his moment finally came in a Super Bowl performance that put him on the level of the quarterbacks who were treated with more acclaim. His stats were good but it was the way he stood strong in the pocket to deliver the game clinching 64 yard touchdown to Lynn Swann while being knocked out. You could see he knew was going to get clocked as he side stepped Cowboy linebacker DD Lewis and gathered himself to throw deep. Much like present Steeler quarterback Ben Roethlisberger is thought of now. He was carried to his first Super Bowl by his teammates. In his second, he validated himself among the great quarterbacks by making the play to win the game. Super Bowl X validated the career of Terry Bradshaw and he didn’t have to look over his shoulder the rest of his career. 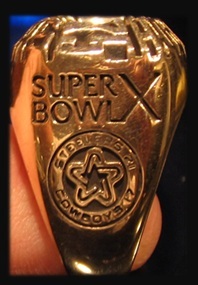 Two more championship triumphs were to follow and this ring commemorated the Steelers becoming a dynasty. Bradshaw would go on to make the Pro Football Hall of Fame, however the contributions of “Jefferson St” Joe Gilliam shouldn’t be forgotten. This article is dedicated in the memory of Joe Giliam. This entry was posted in Ring of Champions and tagged 1975 Pittsburgh Steelers, Franco Harris, Jefferson St Joe Gilliam, Joe Gilliam, John Stallworth, Lynn Swann, NFL History, Super Bowl, Super Bowl X, Super Bowl X Ring, Terry Bradshaw, The Steel Curtain. Bookmark the permalink.